Now, this is Chicken Noodle Soup! My mother’s old-fashioned chicken noodle soup, in my opinion, is as authentic as it gets. 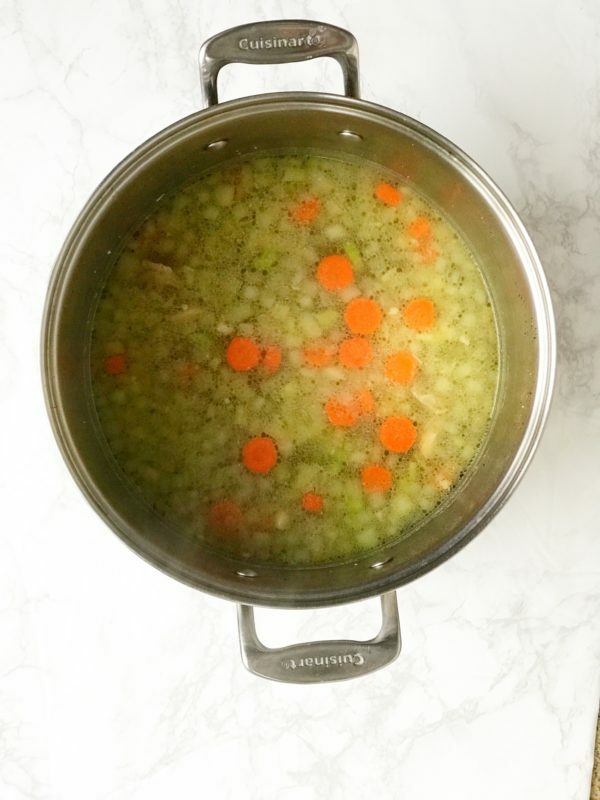 She was a passionate stickler for a squeaky clean chicken when it came to her recipes and the result was pure, flavorful, savory, “Can I have seconds please?“, soup you will want to sink your spoon in to. When it comes to cooking, I like to get creative whenever possible. That means being flexible with my ingredients, adjusting the flavors, or creating a new twist on an old recipe. However, when it comes to this chicken noodle soup recipe, I am UN-apologetically organic. There is just no comparison for the rich, meaty, authentic chicken flavor you will find in an organic chicken. The same rule applies to the celery used in the soup. Because celery is on the Dirty Dozen list of food with the most pesticides, I always use organic celery. The onions are on the Clean Fifteen list, so the conventional option is just fine. Finally, carrots do not land on either list, but I do use organic carrots since I think the flavor is better than their conventional counterpart. An old-fashioned Chicken noodle soup wouldn’t be the same without hearty, tender egg noodles that taste freshly made. My mother always used Alberto’s extra wide egg noodles in her soup, and that tradition lives on in my kitchen. You can find these noodles at most local grocery stores. My favorite part of this recipe, besides its incredible flavor and taste, is the ease of making it. It only takes a few essential ingredients to create an entire pot of healthy, delicious, mouthwatering soup. The character and flavor of this soup largely depend on adjusting the salt until the flavor comes through, being careful not to add too much or too little. A beautiful full-bodied flavor is achieved when just the right amount of salt is added to the broth. Here’s a little secret: I usually double the recipe and make enough to freeze in family size containers. 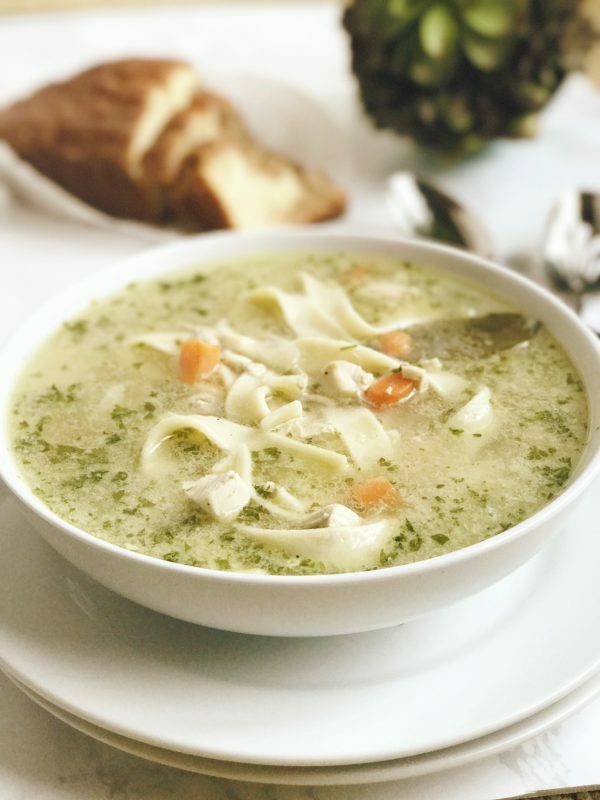 Honestly, there is nothing better than having this incredible soup on hand when you are feeling under the weather or need a delicious meal in a hurry. Give this one a try and see what old-fashioned chicken noodle soup should taste like! 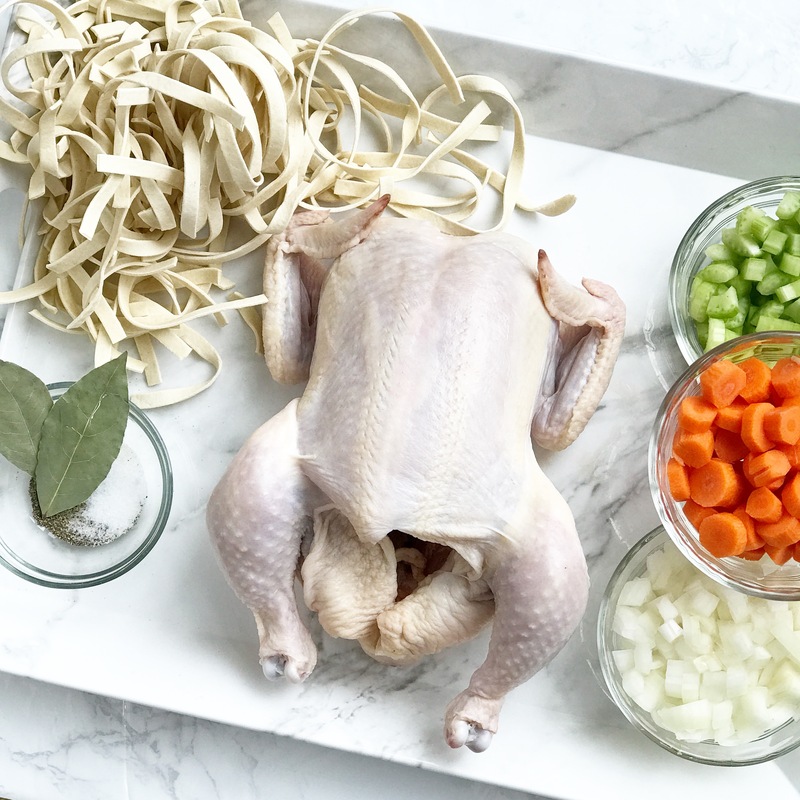 This is an old-fashioned chicken noodle soup recipe the way Mom used to make it. It's made with organic chicken, organic vegetables, and authentic egg noodles, creating a soup your entire family will love. Clean the inside of the chicken thoroughly, removing any blood, veins, and debris. Boil the chicken, salt, pepper, and water in a large pot for 1 hour. Turn off the heat and remove the chicken from the water, setting it aside on a cutting board to cool until you can cut meat from the bones. Chop the meat into 1/2-inch cubes. Transfer the chicken cubes back into the pot, returning the heat to medium-high. Add the carrots, celery, onions, and bay leaves to the broth. Simmer 15 to 20 minutes or until you can pierce the carrots with a fork. If you are using long egg noodles, break them in half and immerse the noodles into soup. Continue to simmer for 25 to 30 minutes or until the noodles are soft. Stir in the parsley and simmer 5 minutes. Remove the pot from heat. Adjust the flavoring by layering in the salt until a full-bodied flavor is achieved. Remove the bay leaves before serving. The character and flavor of this soup largely depend on adjusting the salt until the flavor comes through, being careful not to add too much or too little. A wonderful full bodied flavor will be achieved when just the right amount of salt is added. Organic chicken has more flavor and will create a much better soup. The most important step in this recipe is to clean the chicken inside and out using cold water. This will prevent any unpleasant cavity particles found inside the chicken from becoming part of your soup. 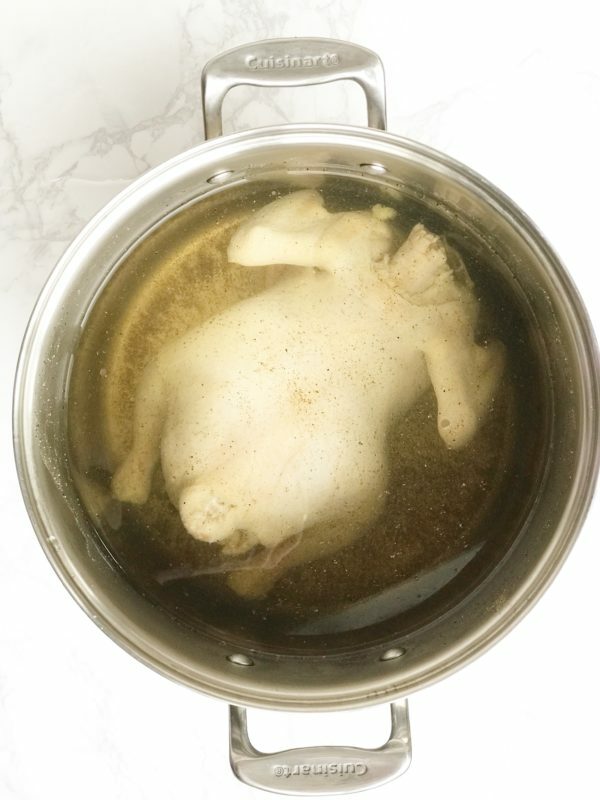 Be sure to clean and sanitize your sink and workspace once the chicken is placed inside of the pot to prevent contamination from the raw chicken. I use Alberto’s extra wide egg noodles. If noodles are too long, break them in half before placing into soup. If you omit the noodles, it makes a delicious gluten-free chicken vegetable soup. Thanks for inquiring. I am so glad you asked Every question is a good one! In step #2 I do mention adding salt to the broth and in the ingredients list, it says to add more salt if needed. However, I always recommend lightly layering in the salt when seasoning the final broth to taste because it only takes a little salt to enhance the flavor. I like to add extra pepper to the soup once it is ladled into a bowl so I can add as much as I’d like at that time. Hope this helps! Enjoy! Loving our soup tonight. We know this recipe is really special.thank you for posting it. Thank you, Carol! I’m so glad you loved it! Thank you for sharing!